Aside from watching Peeps explode in the microwave, there are actually several ways to reuse these sugar covered marshmallows. 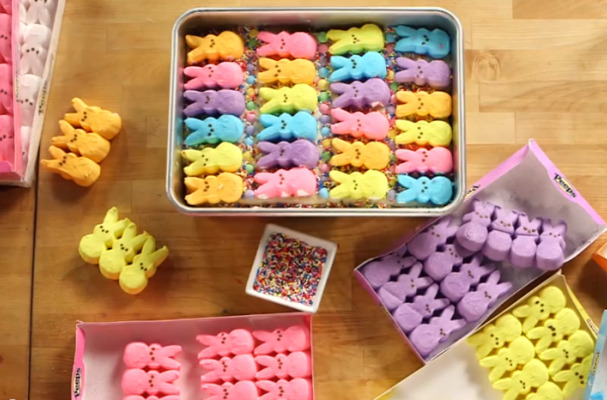 Whether you stick them in a sandwich or pair them with chocolate, Peeps can be used in many recipes that call for marshmallows. With easy treats like these, you can enjoy this spring candy a little while longer. This fluffernutter sandwich re-purposes Peeps to be apart of this ooey gooey treat. Sweet white bread is slathered with creamy peanut butter and crushed Peeps. The sandwich is heated for a few seconds in the microwave to help soften the candy and make it easier to eat. These colorful Peeps cookie bars are an inviting sweet that are hard to resist. A box of yellow cake mix is converted into cookie dough with the addition of butter and egg yolks. Rainbow sprinkles add a pop of color to each bite. Before the cookie bars are decorated with neon hued peeps, they are topped with a white chocolate fudge to help the candy stick to the cookies. Peepshi (AKA Ppeps sushi) is a fun way to enjoy leftovers of this Easter candy. The sugar crusted marshmallows are paired with Rice Krispie treats and fruit leather. Kids and adults will love this innovative way to eat Peeps. If you are feeling indulgent, Peeps skillet s'mores dip is an incredibly easy dessert that will definitely satisfy your sweet tooth. Chocolate chips are topped with Peeps and stuck in the oven to brown. 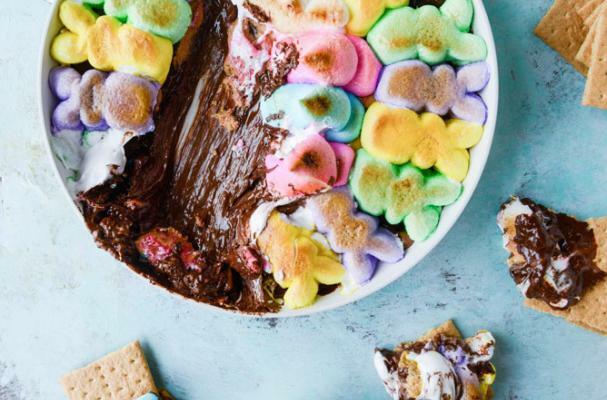 The result is a sticky mess of melted chocolate and marshmallows that are only made better with graham crackers for dipping.